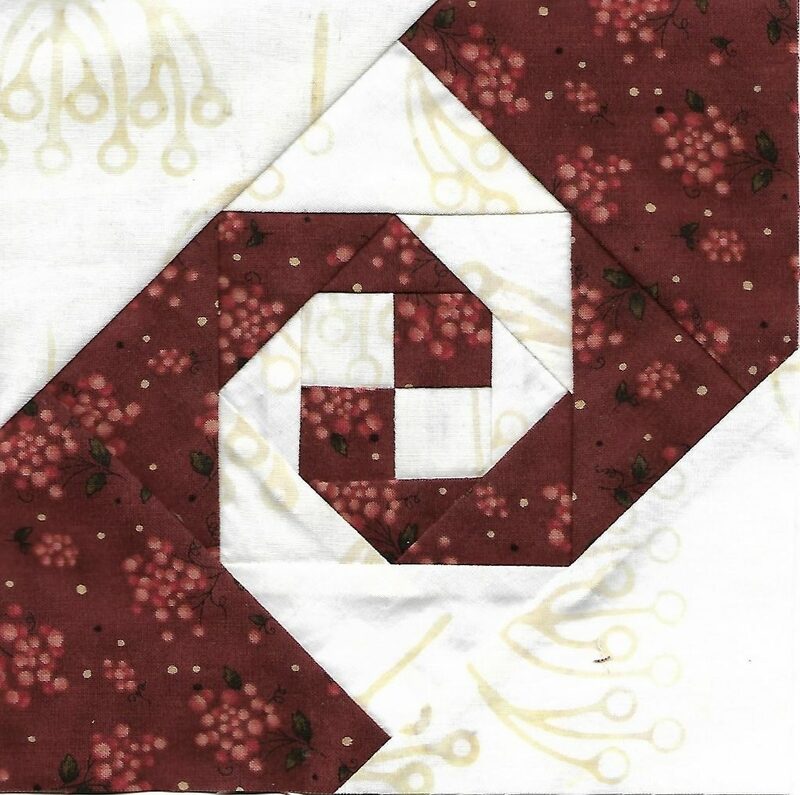 Happy Spring Forward Day – to celebrate losing an hour this weekend, I added the borders to my Good Fortune quilt yesterday. 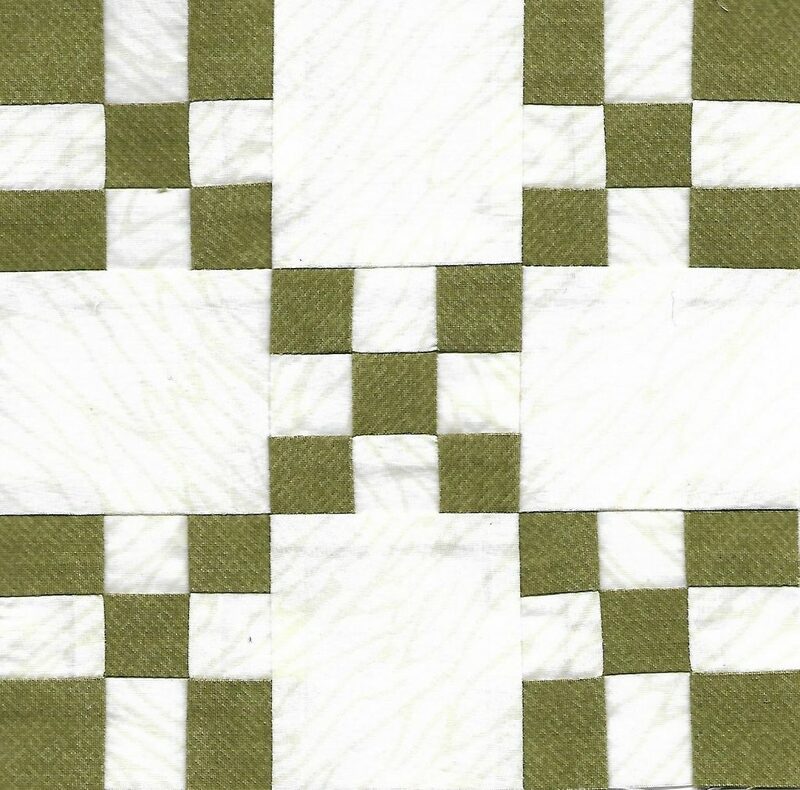 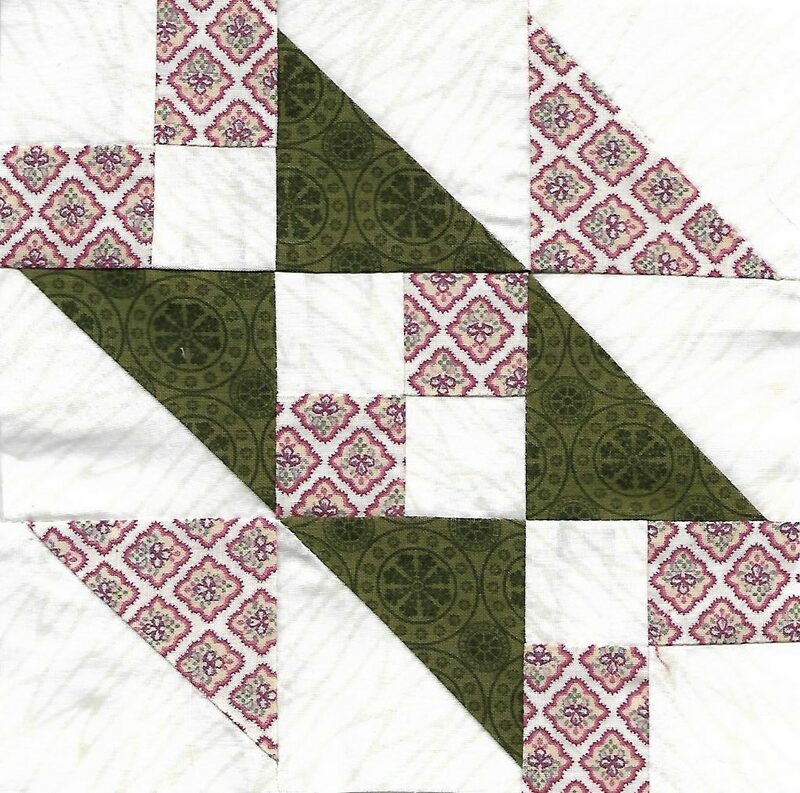 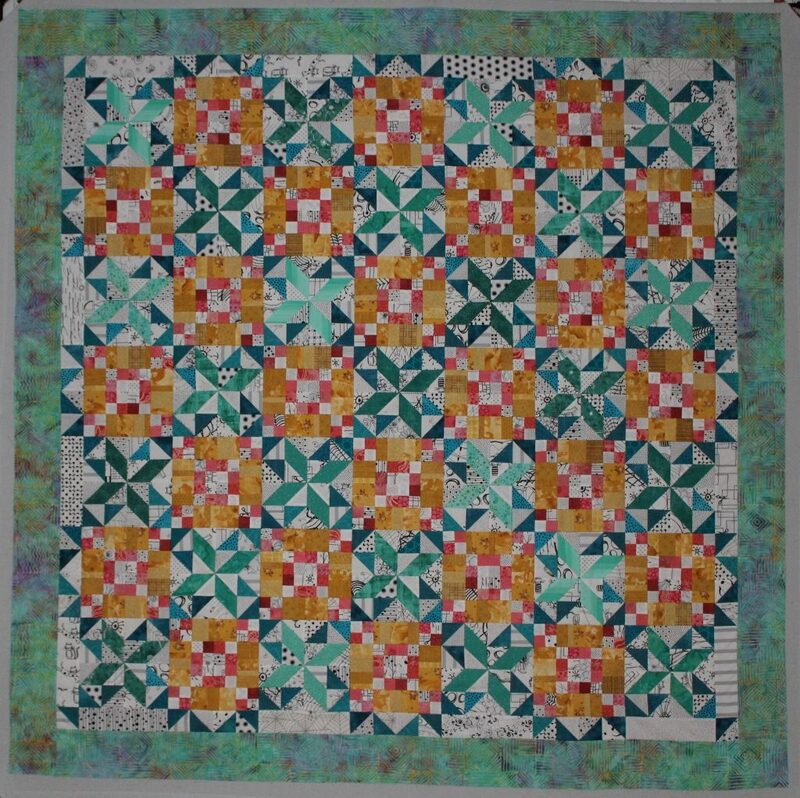 After staring at the quilt center on my design wall for several weeks, I decided that I really wasn’t excited about sewing all the pieced borders in the Bonnie Hunter’s instructions. 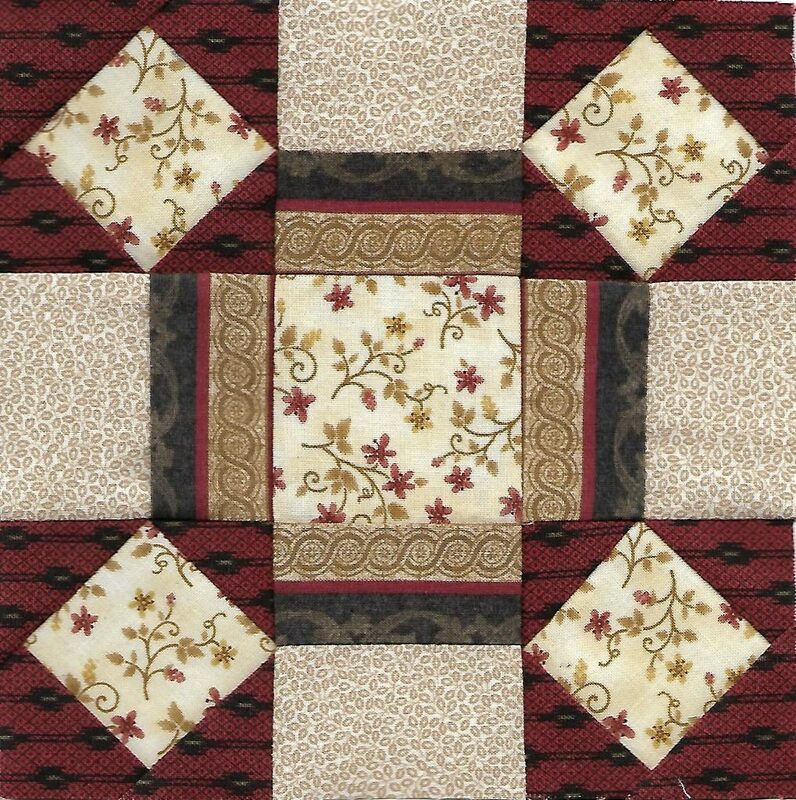 So off to the quilt shop I went looking for the perfect border fabric. 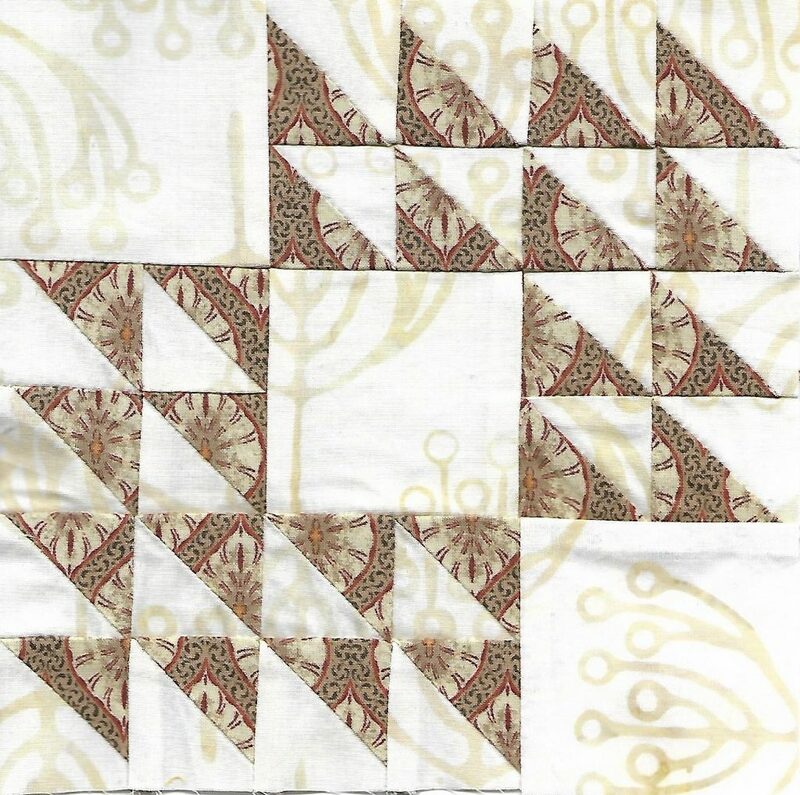 After many “almost, but not quite right” fabrics, I found this batik for the border. 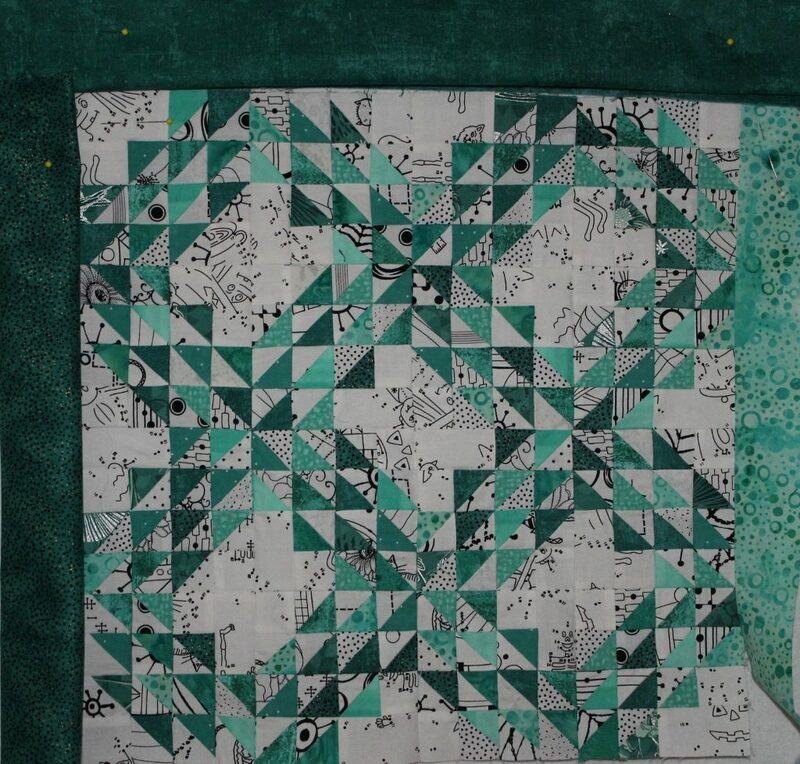 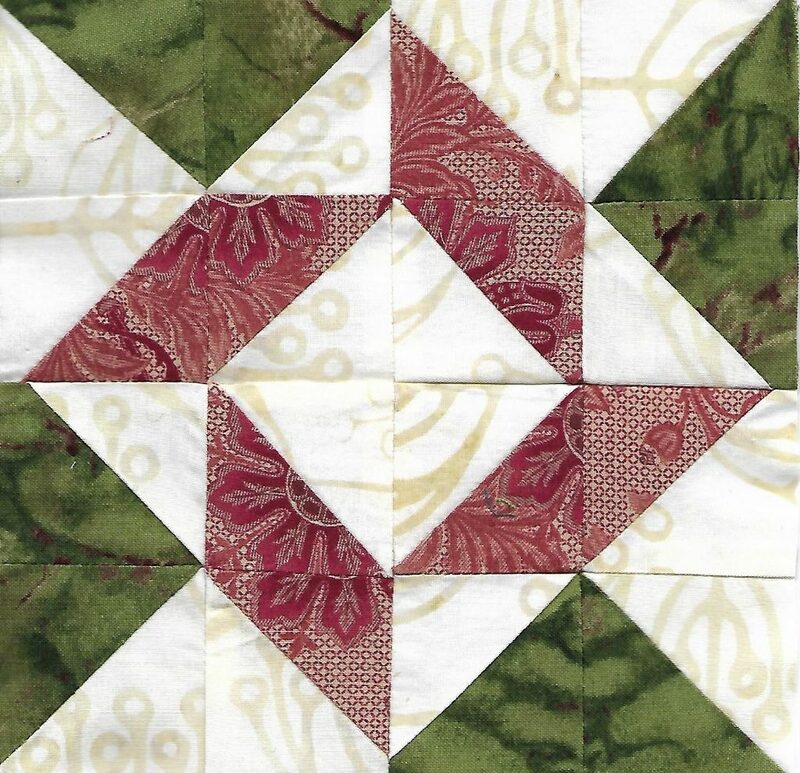 This close up shows how the batik fabric accents the green turquoise stars while also pulling in the gold from the alternate blocks. 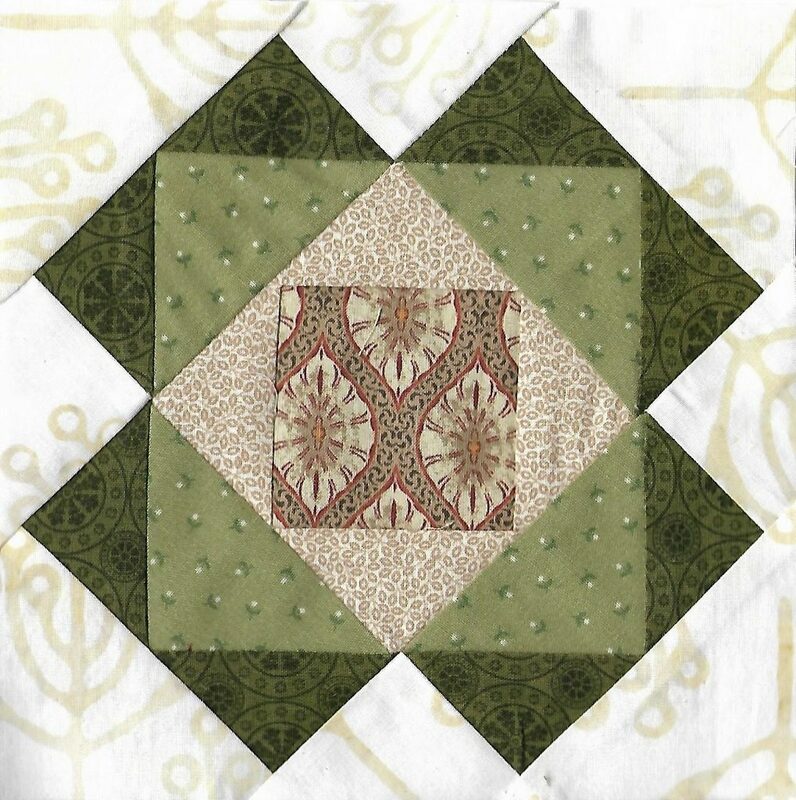 Now that Good Fortune is a completed top, I can concentrate on blocks for Sylvia’s Bridal Sampler. 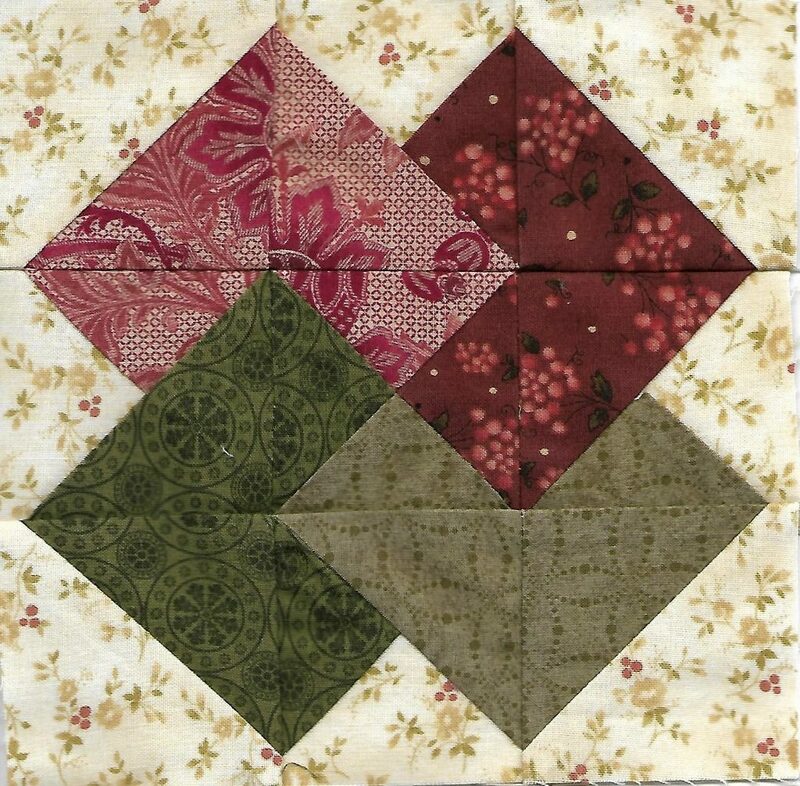 The goal is to make 31 blocks this month, however right now the total is 4. 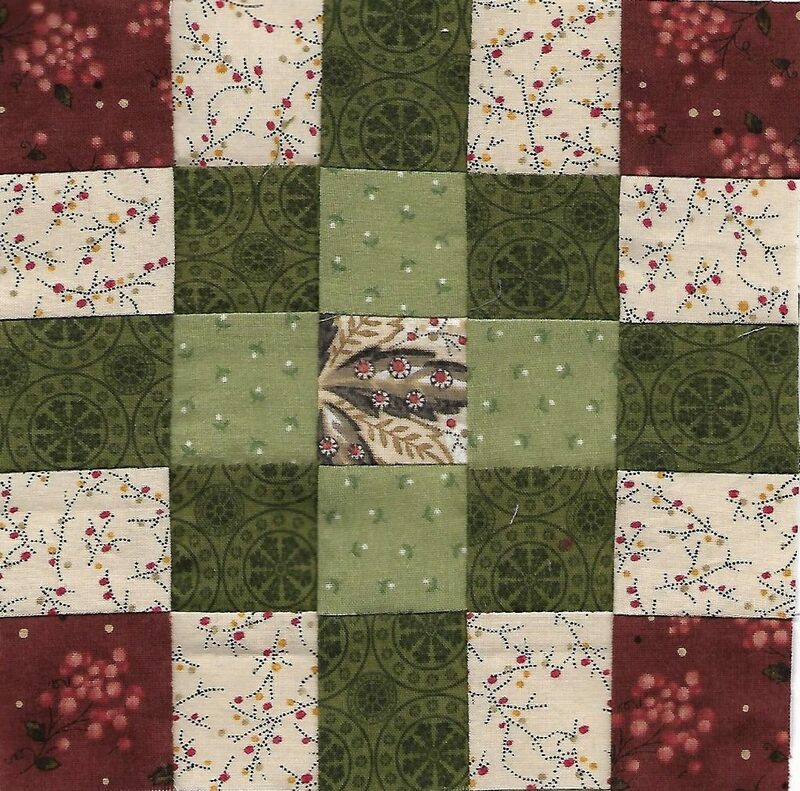 The good news is that March is a long month, so hopefully it will happen. 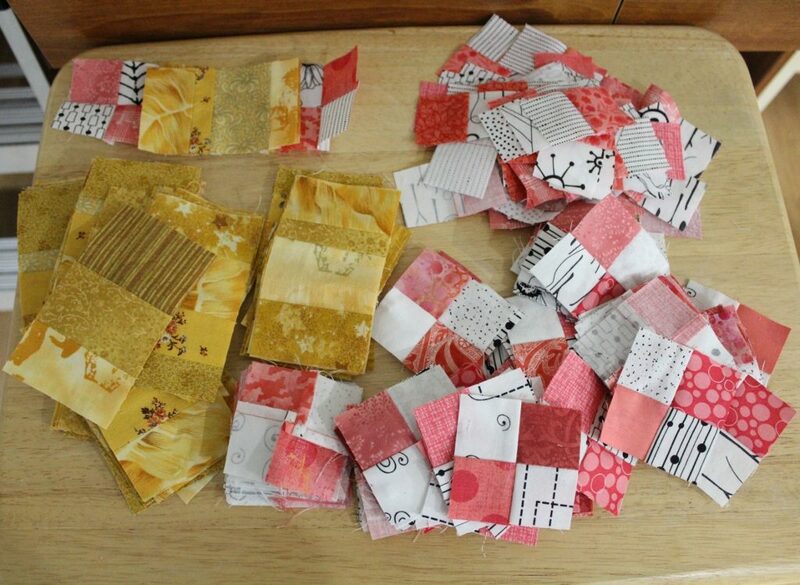 This last weekend a pile of leftover red/white 4-patches were screaming for attention. 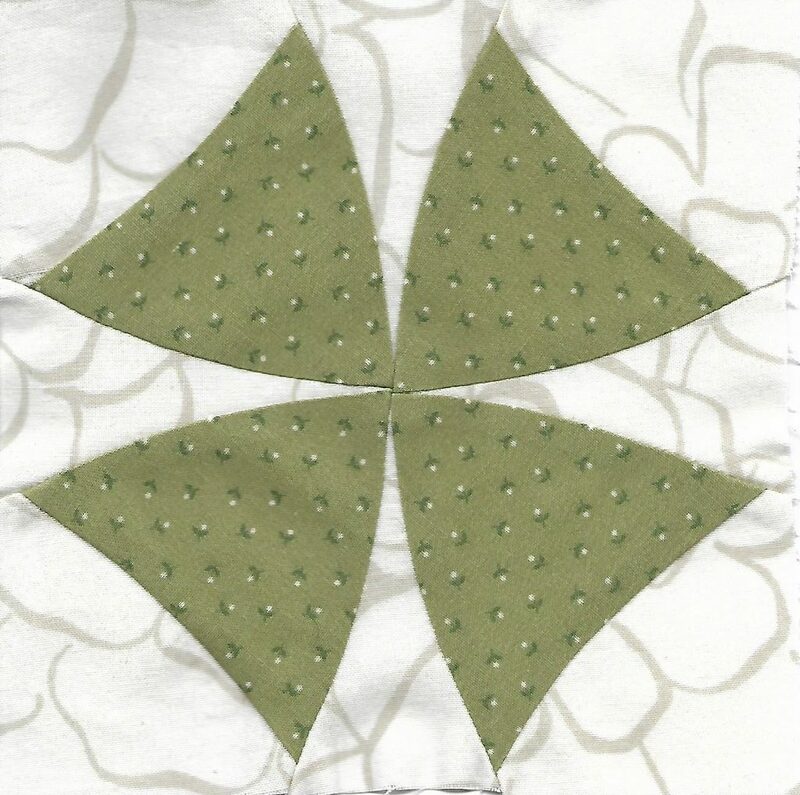 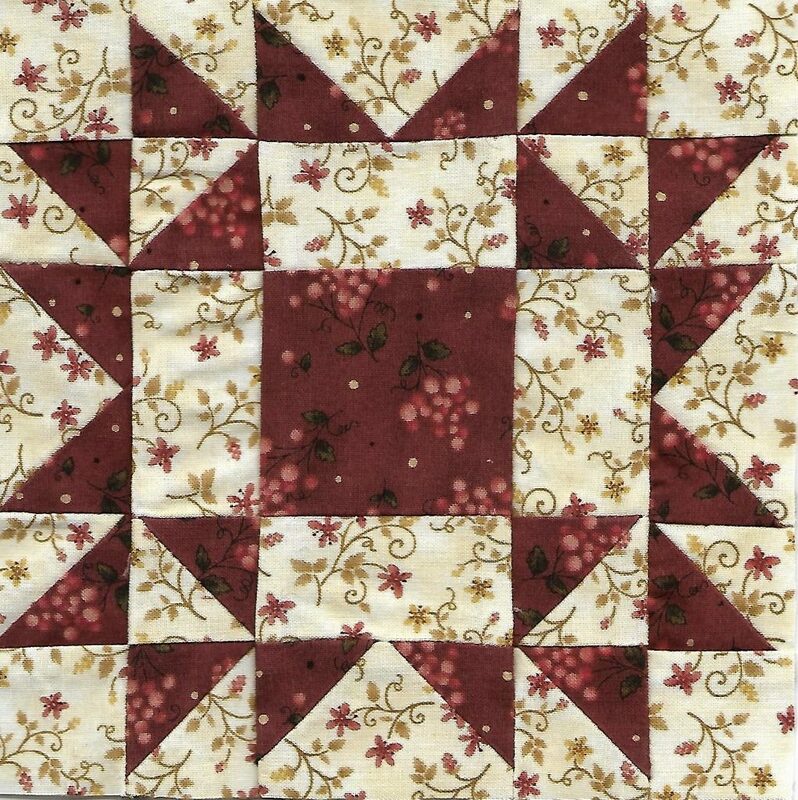 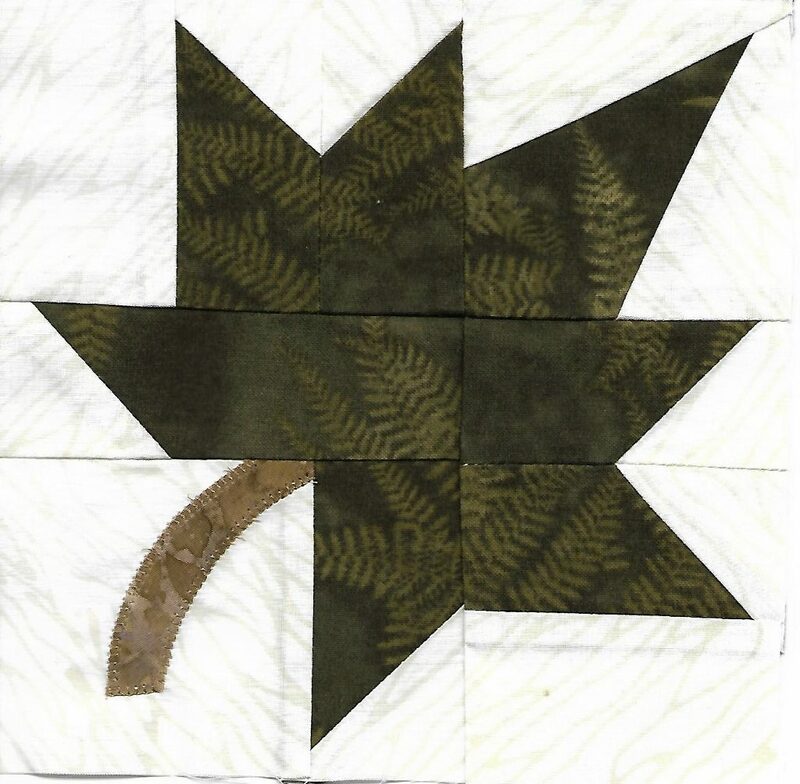 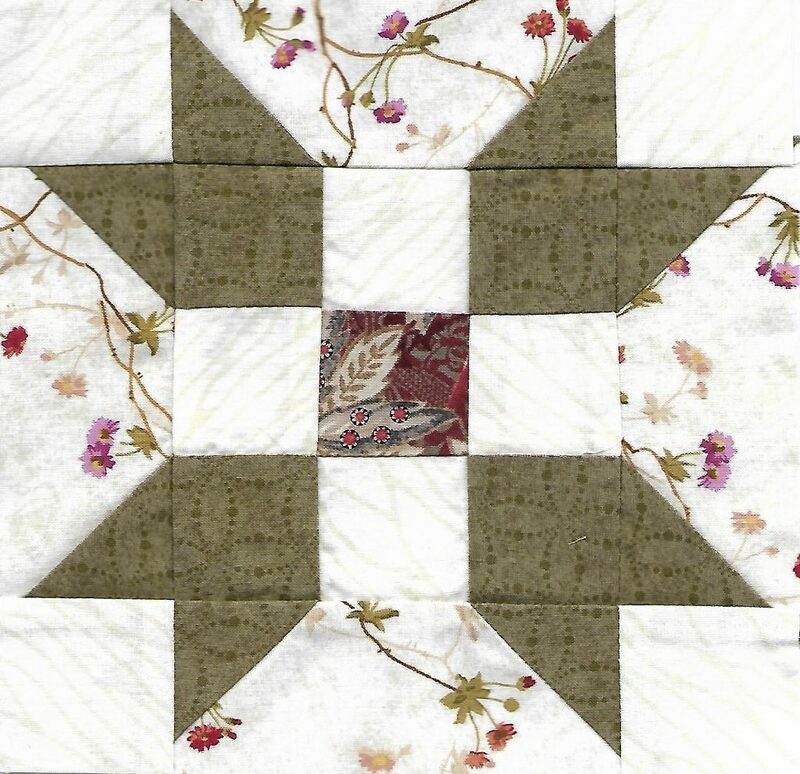 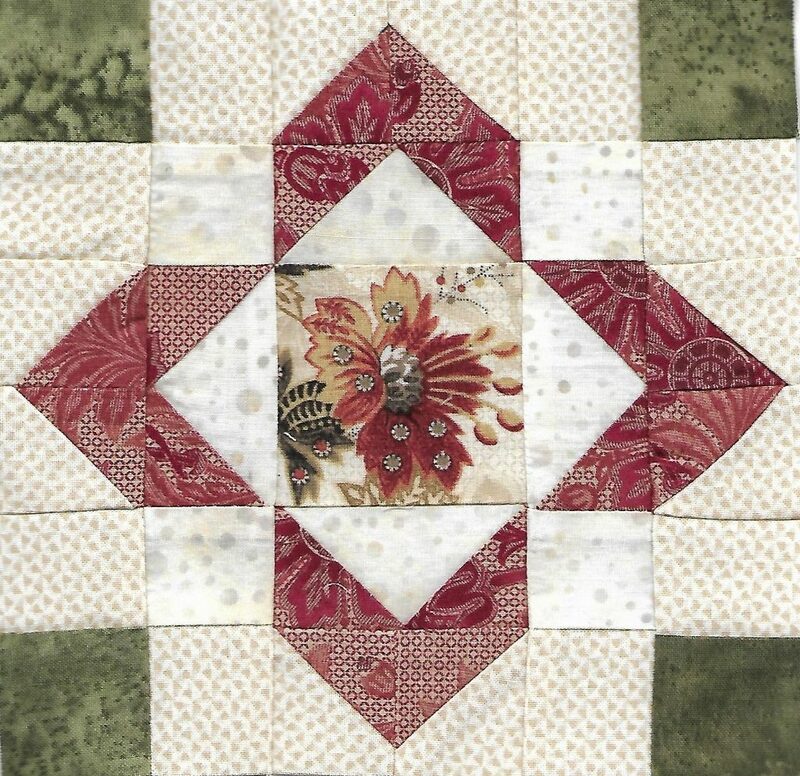 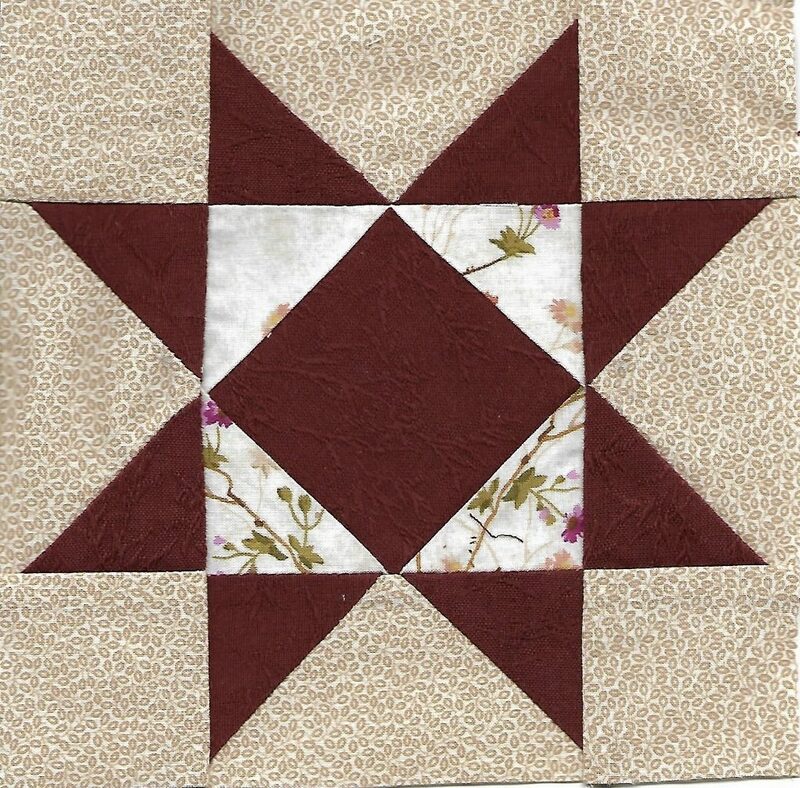 They were just what was needed to make the star from the pattern Hope Chest (in the book Patches of Scraps) by Edyta Sitar. 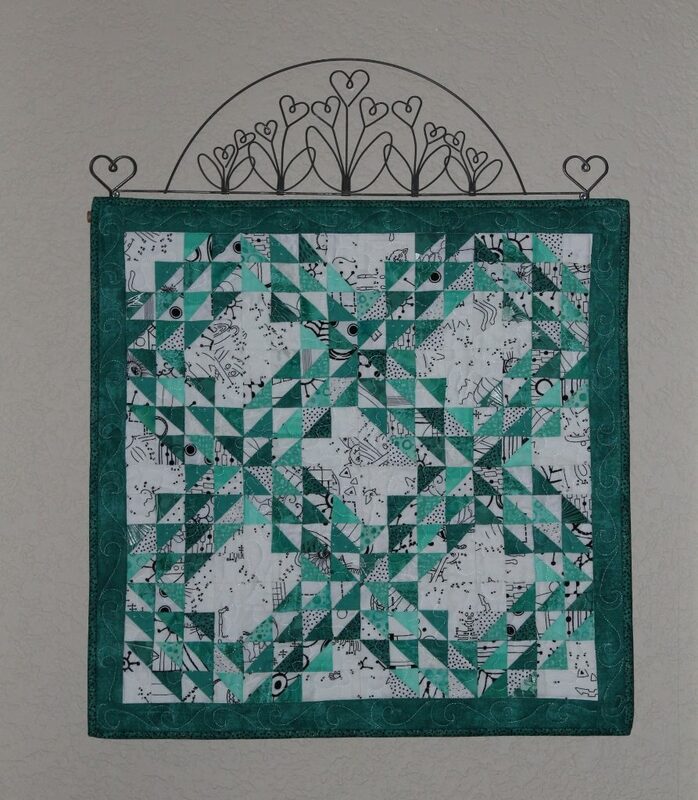 This came together so quickly – Saturday I made the star & Sunday the border, machine quilting and binding were completed. 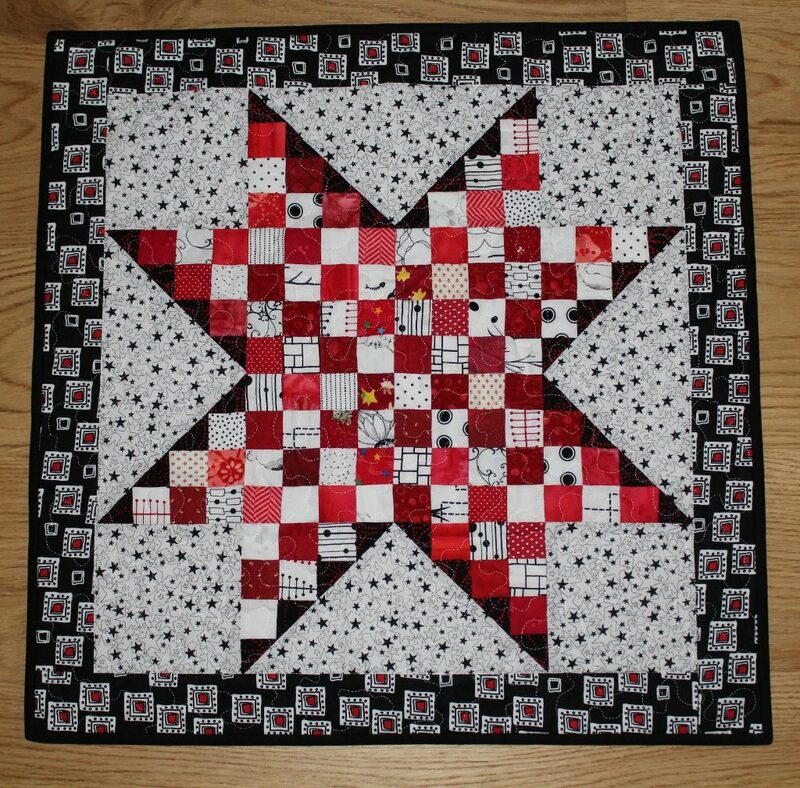 I considered adding a pieced border to this small wallhanging, but once I saw the black/white/red fabric in my stash I knew that would be the finishing touch. 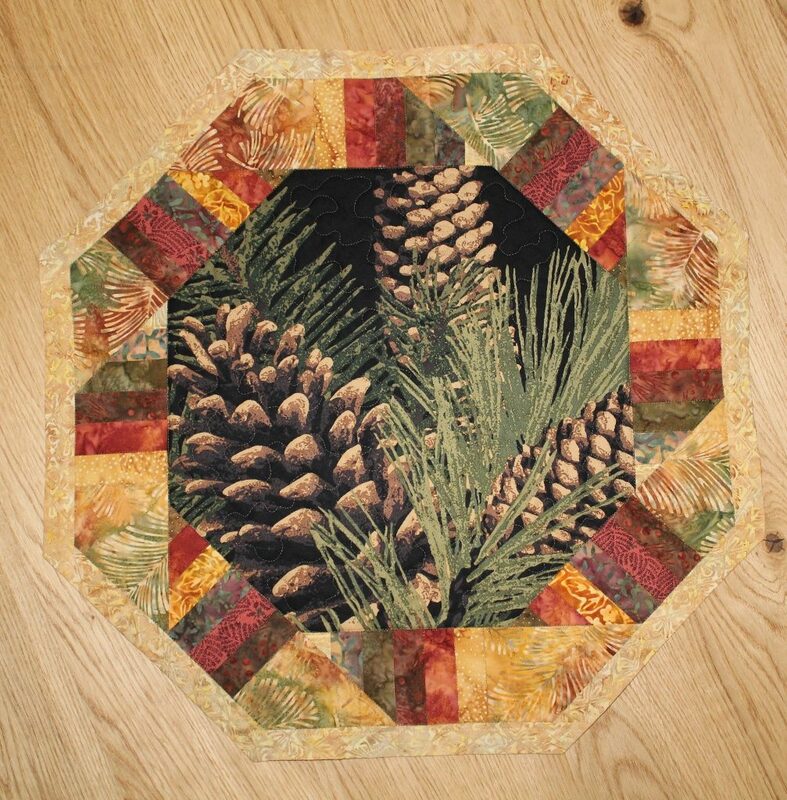 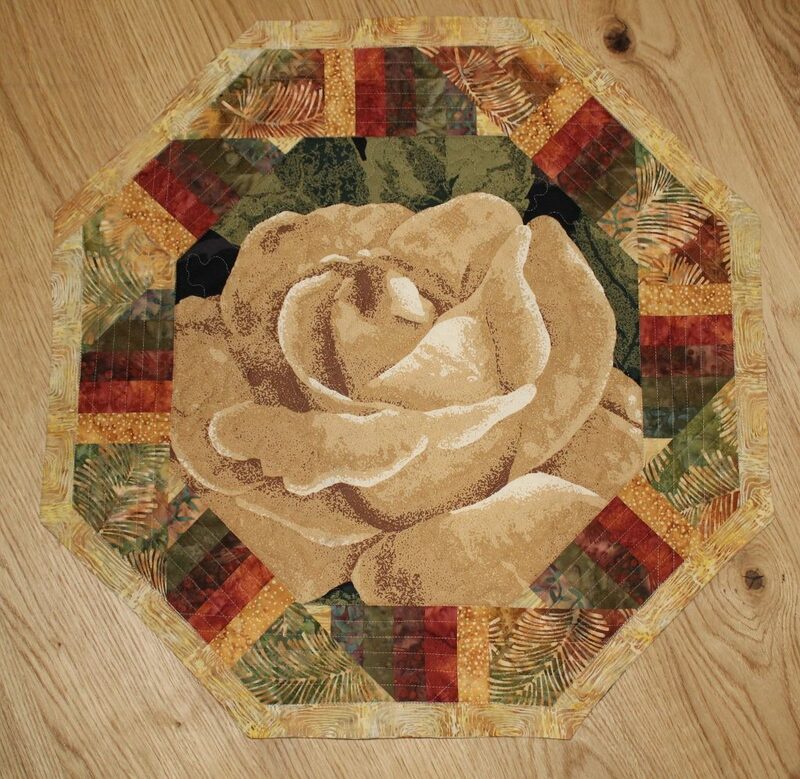 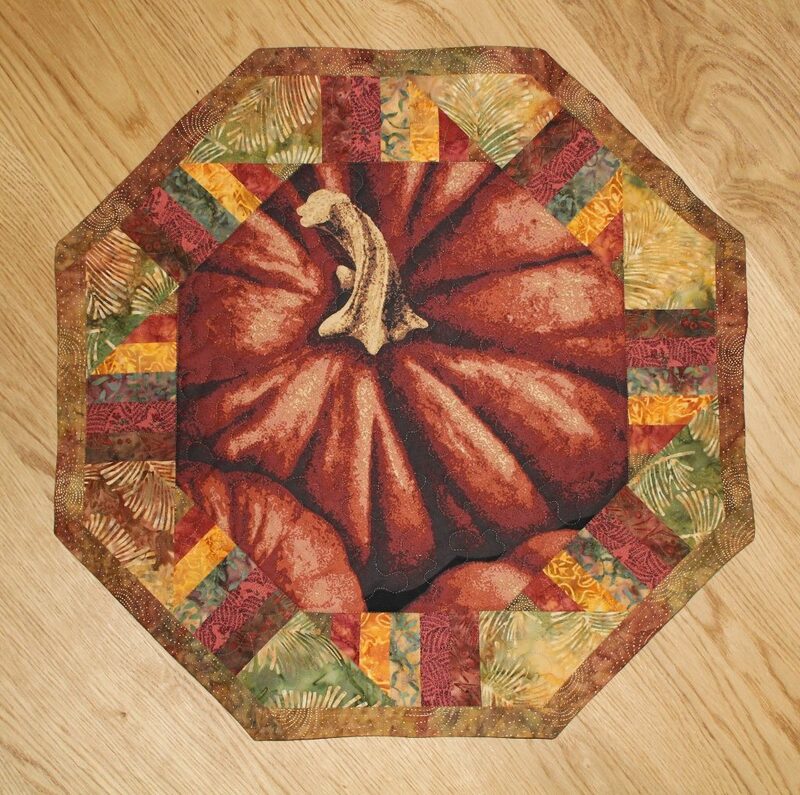 This wallhanging measures 19 1/2″ square, so it was the perfect project to make me smile and give me a sense of accomplishment that something quilty was completed. 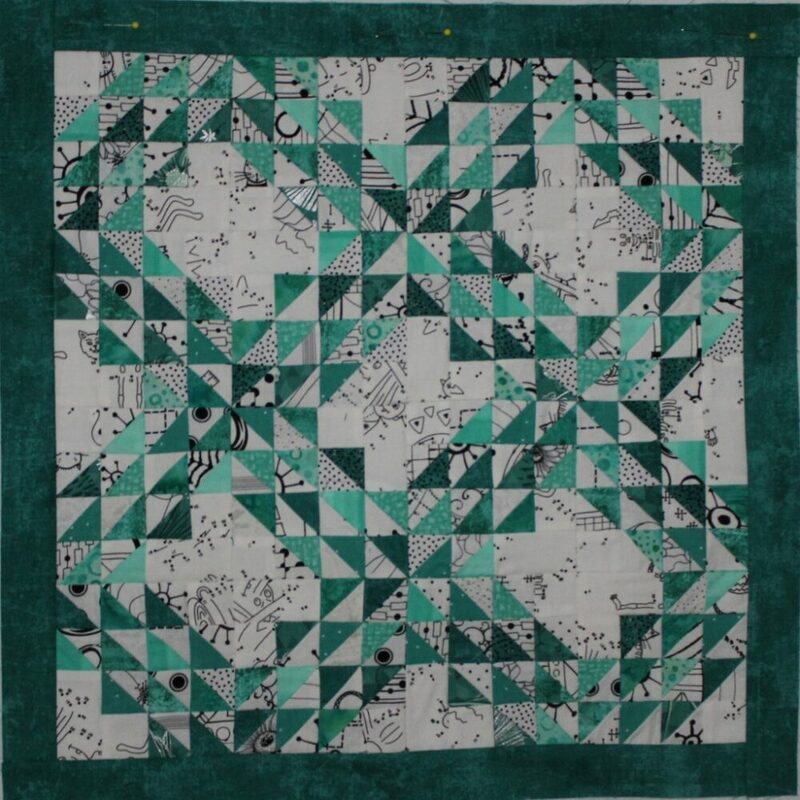 The next project planned is a machine cover for my HQ Sweet Sixteen. 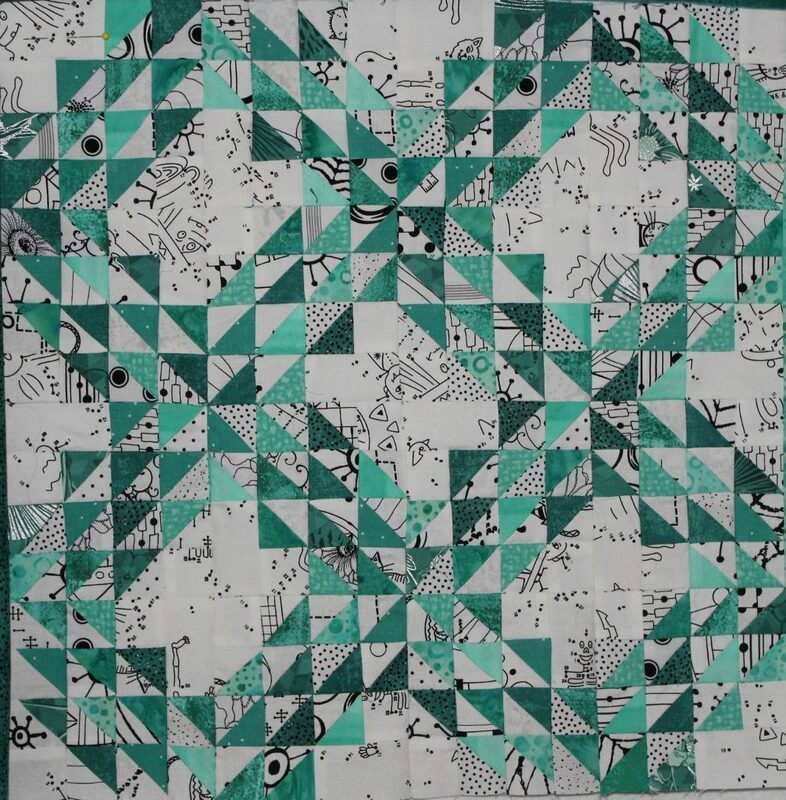 I am hoping to have that finished this weekend. 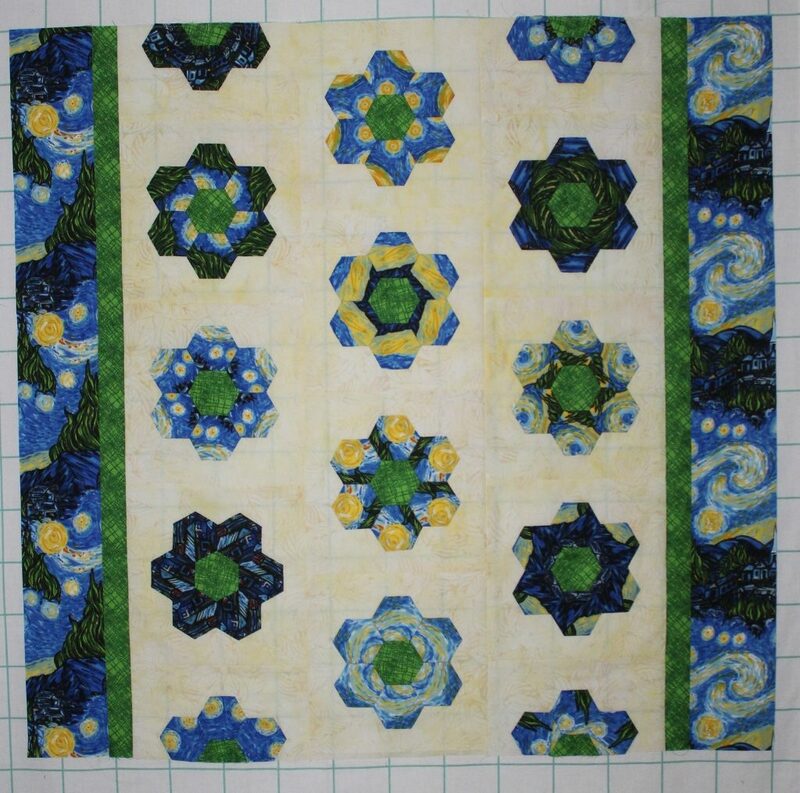 This was the progress on the Starry Night Hexies a week ago – three half blocks to be made with full & half hexie flowers to be appliqued to the background fabric. 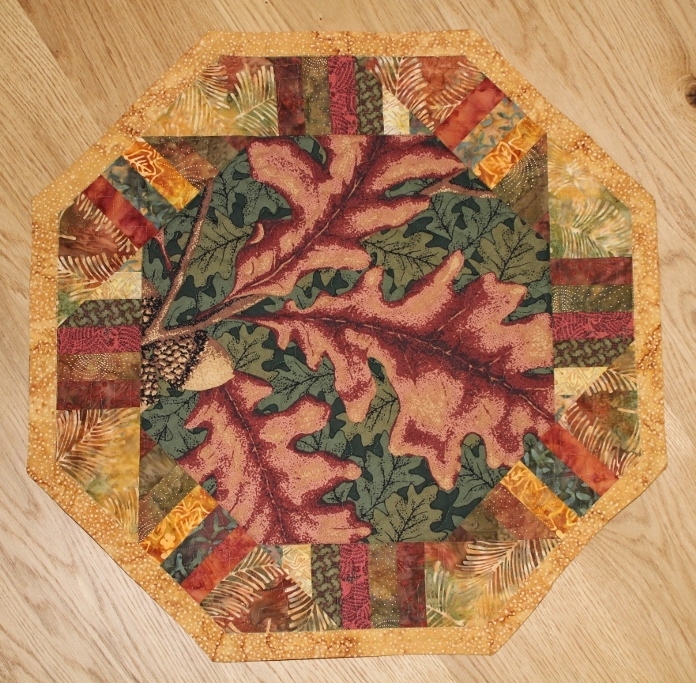 However I was more than ready for this project to get to the quilt top stage, so I focused on the handwork every evening. 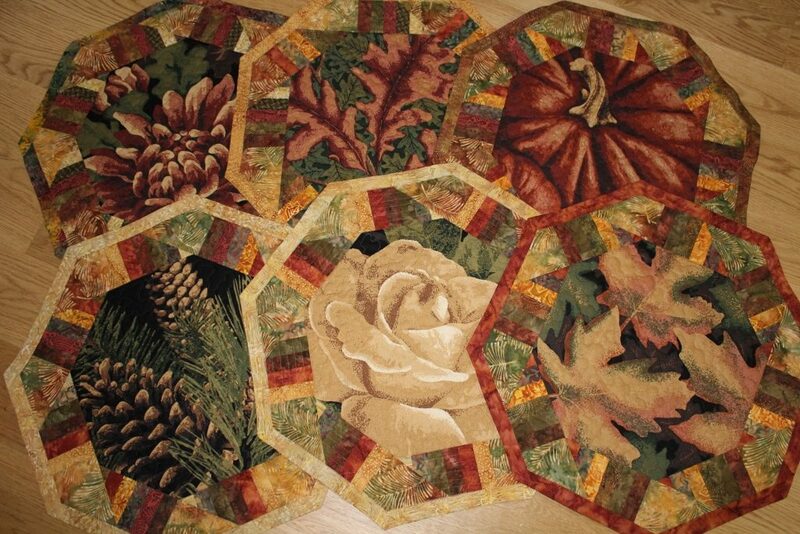 By Friday night I had the blocks completed and the center sewn together. 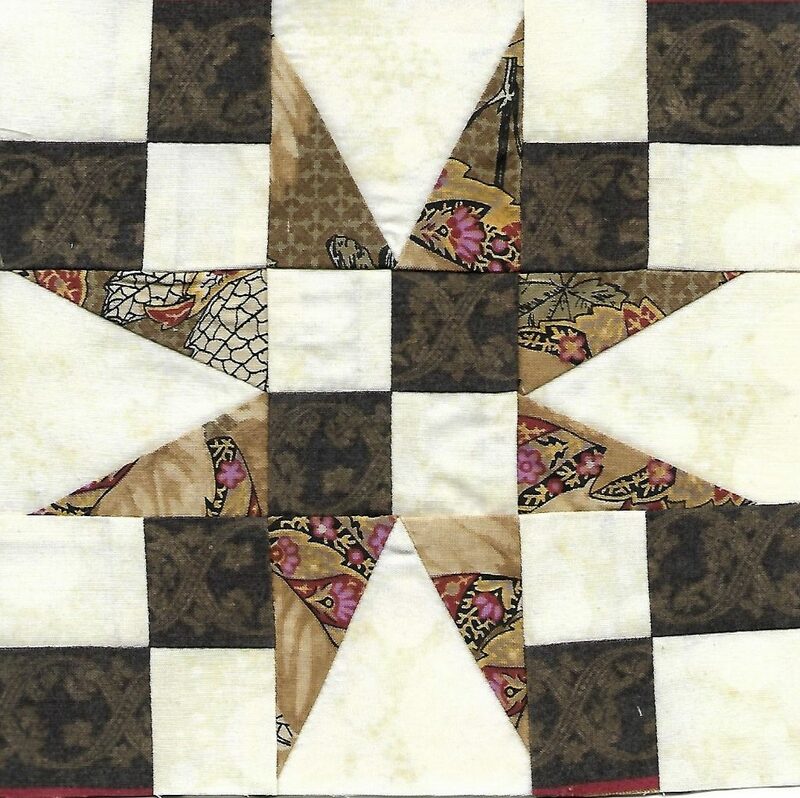 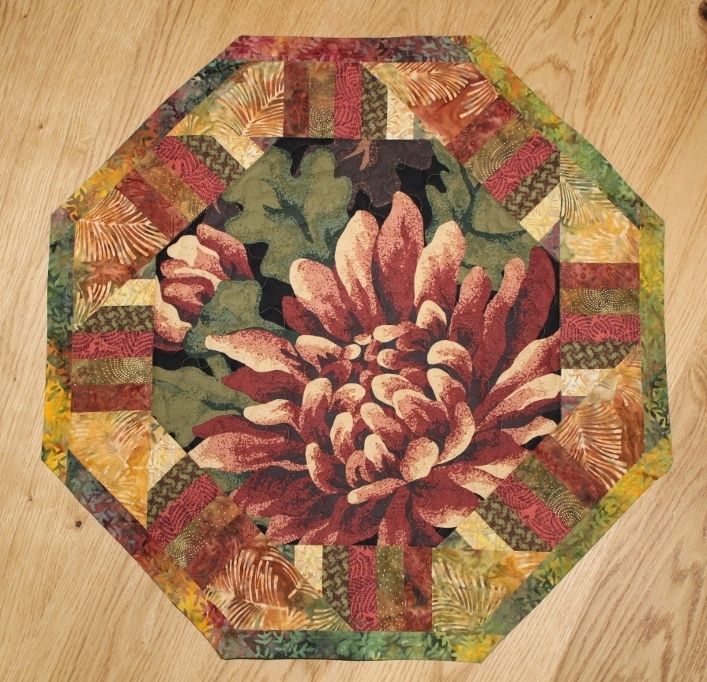 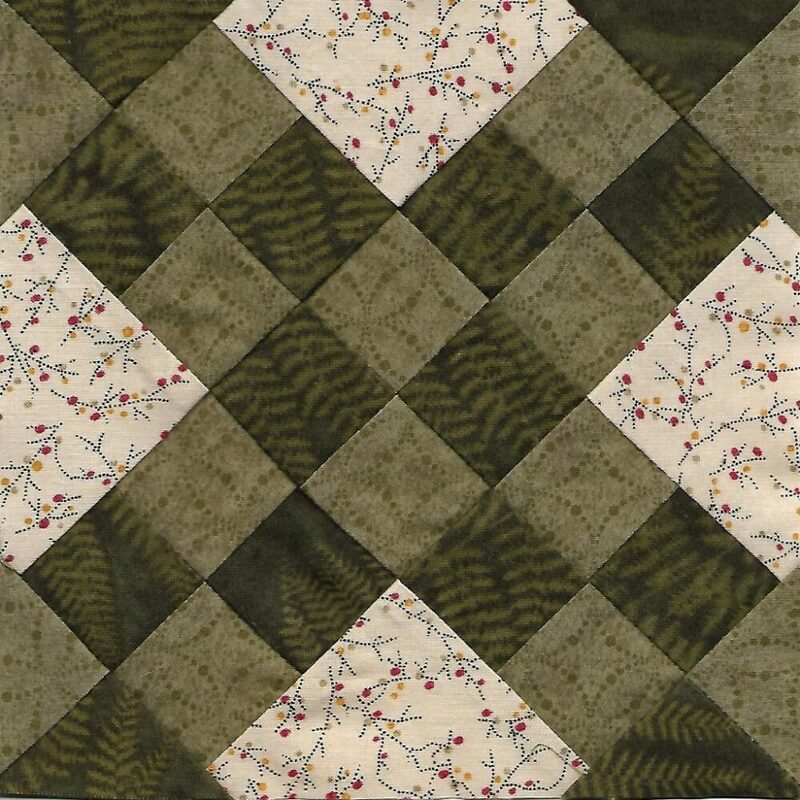 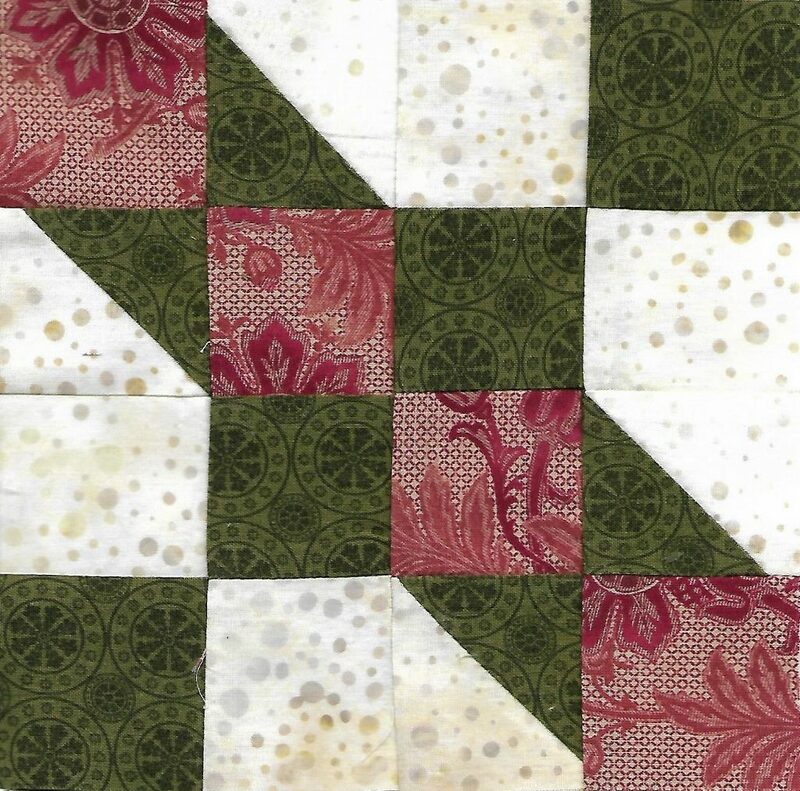 then the top & bottom borders with 4-patch kaleidoscope cornerstones. 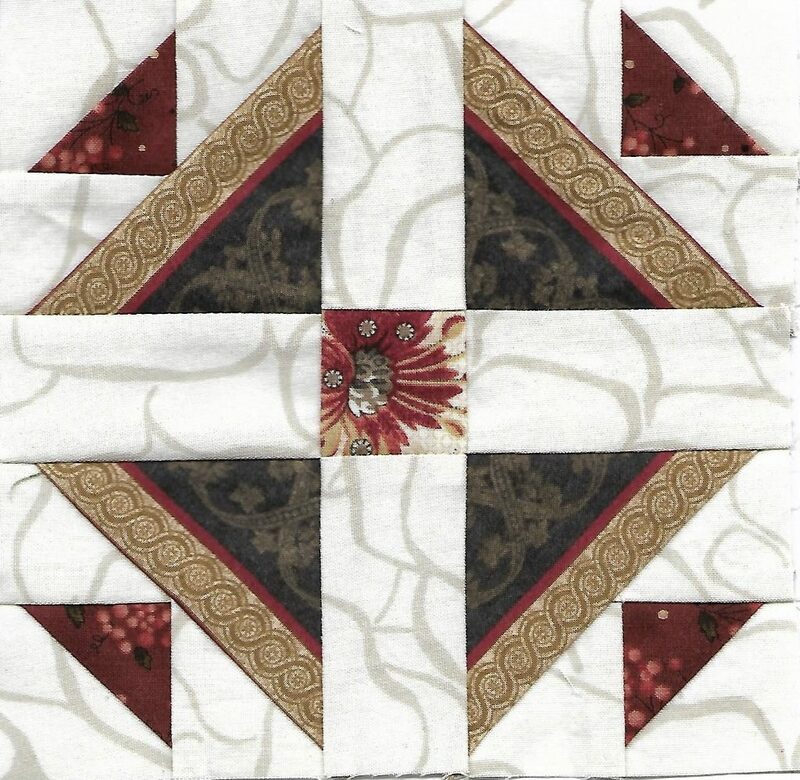 The original pattern did not include an inner border or cornerstones, but I like the additional interest they add to my version. 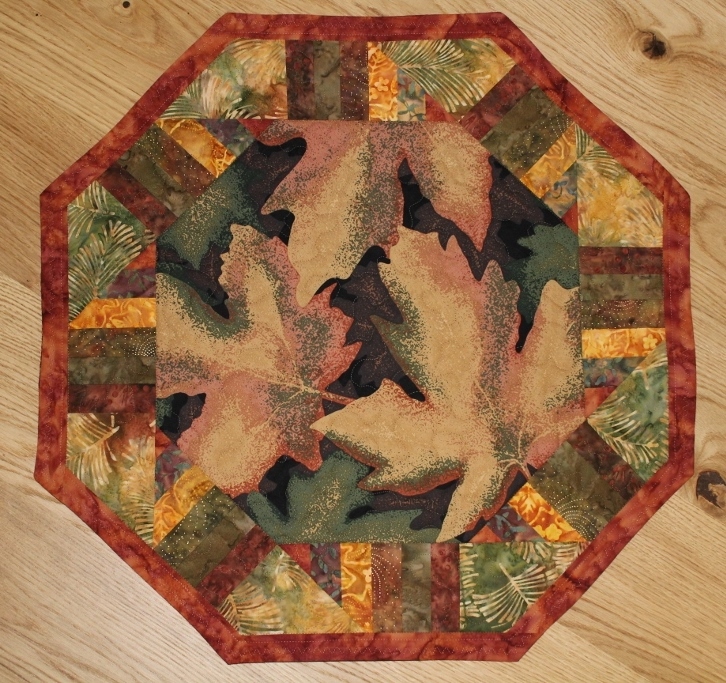 Now I need a new handwork project, but before I can start one there are a couple of pants that need to be mended. 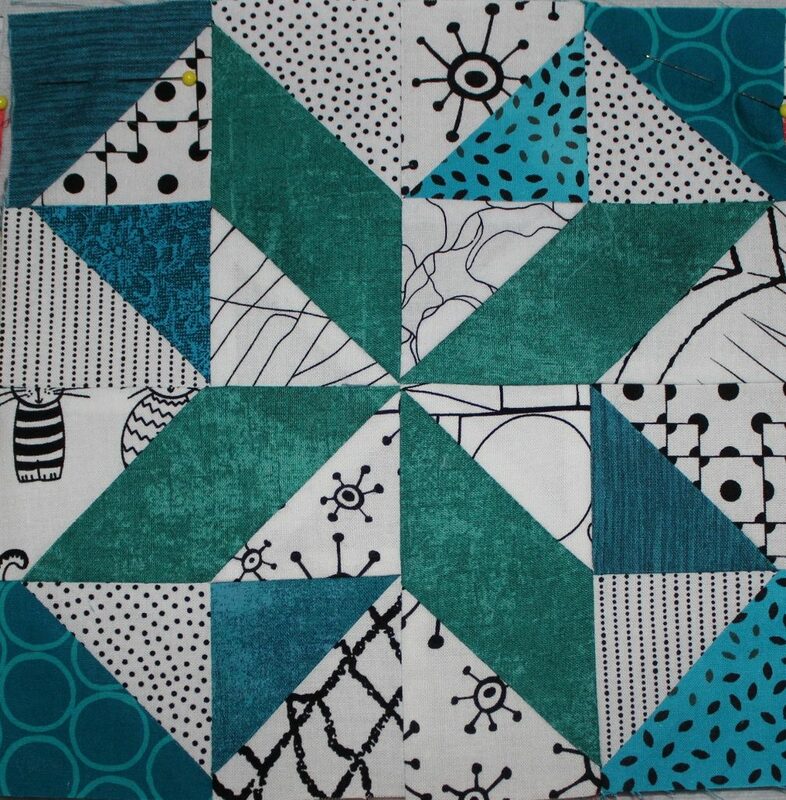 Oh joy! 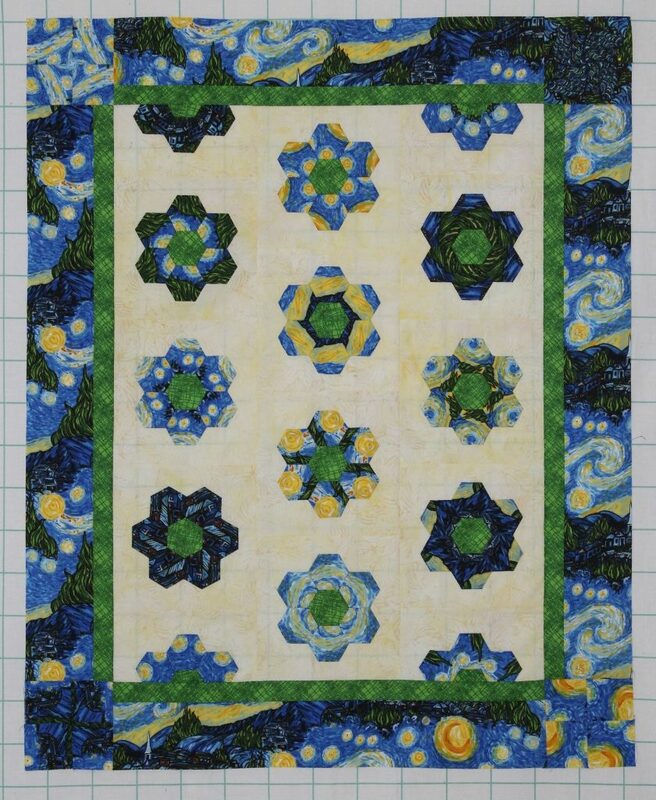 When I first started Bonnie’s mystery quilt Good Fortune, I was going to make 1/4 of the units and change three of the colors. 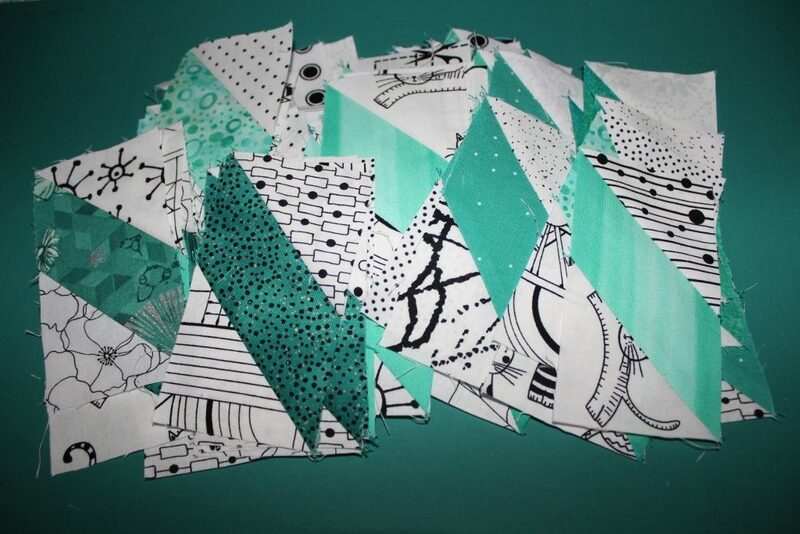 But that plan flew out the window – now I am making all the units and changing four colors. 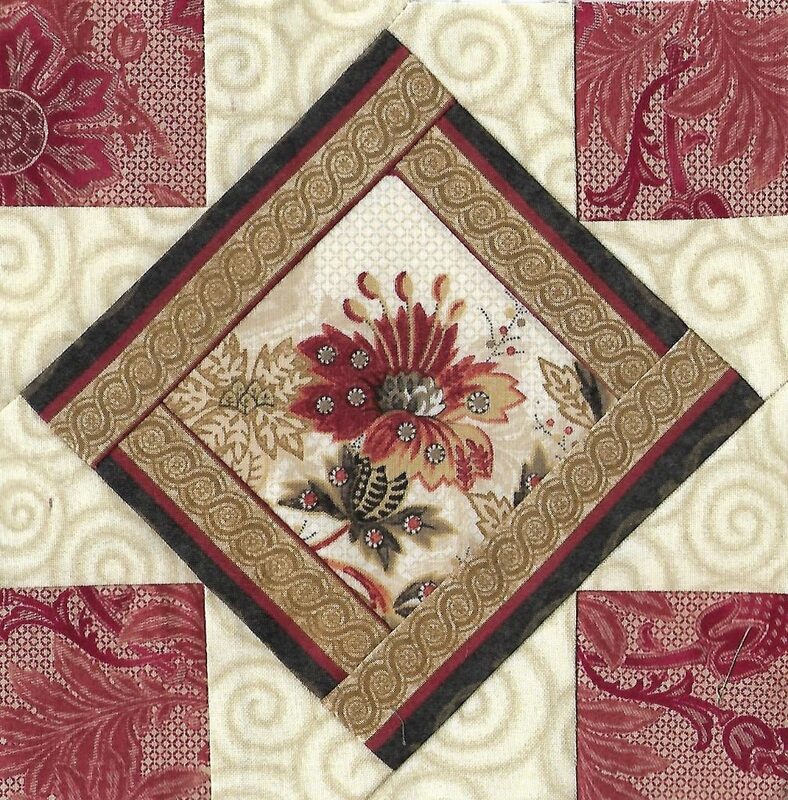 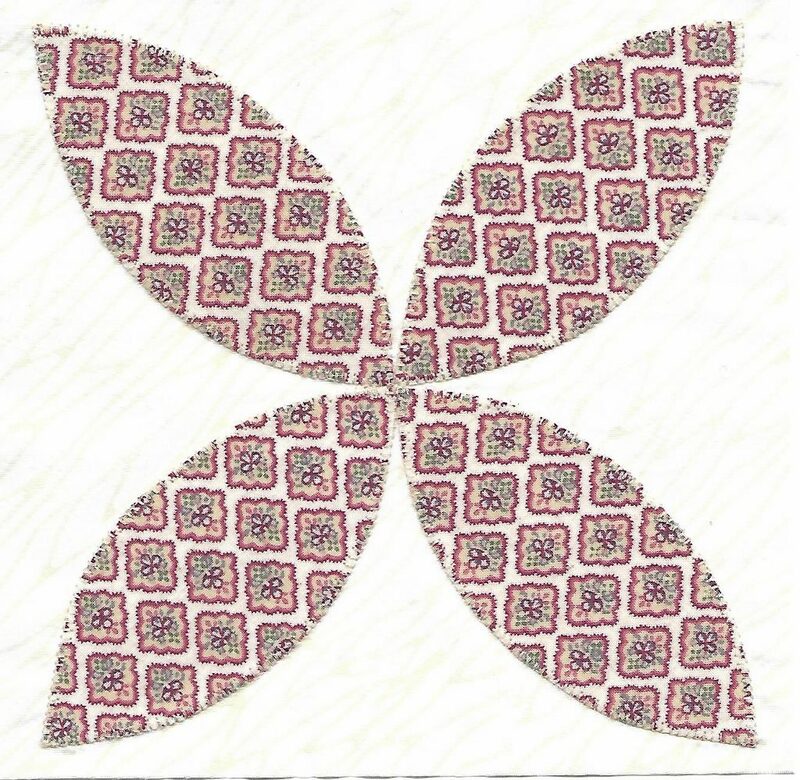 The first clue for Good Fortune was 4-patches of red & neutral. 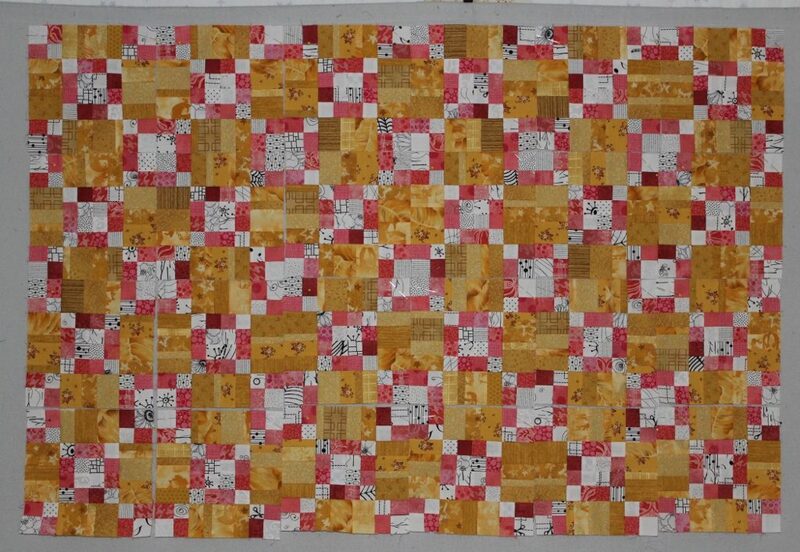 With the new plan the red was changed to coral/salmon, so I had to begin again. 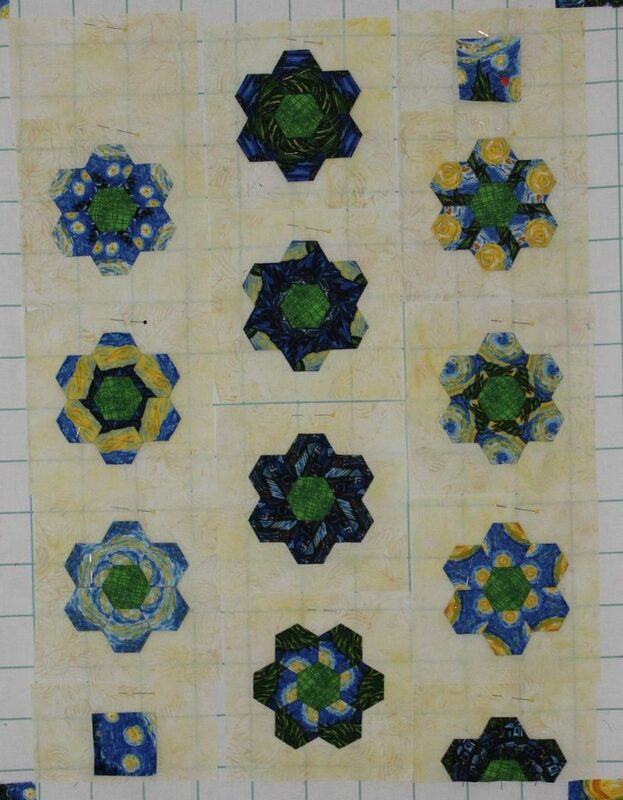 And I had a bit of good fortune discovering that part 4 units and part 1 units combined to make one of the blocks. 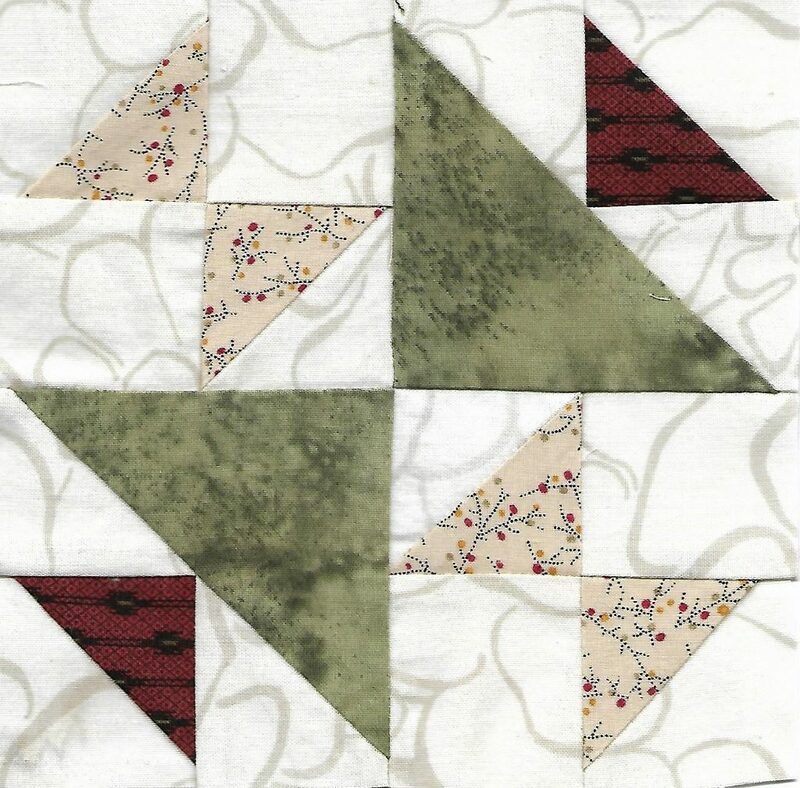 As I was sewing the 4-patches I was also assembling blocks. 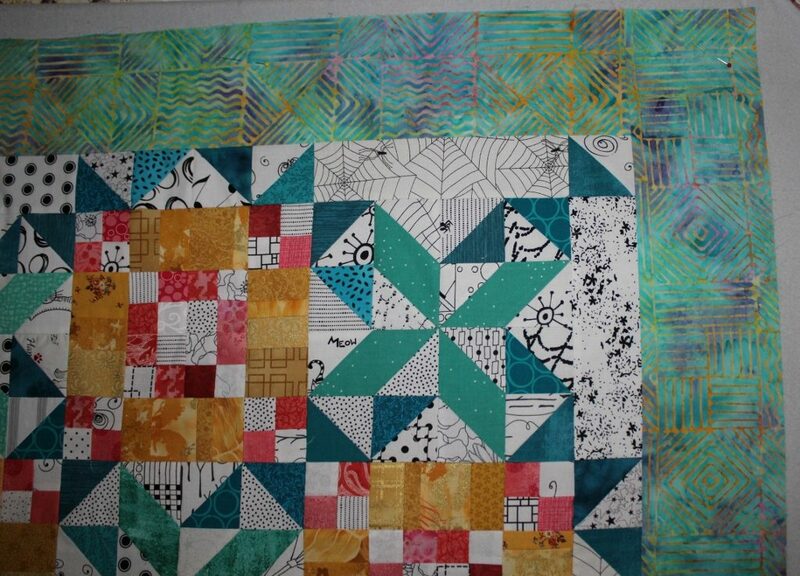 First there were a few, but by the end of the day all these chain blocks needed for Good Fortune were completed. 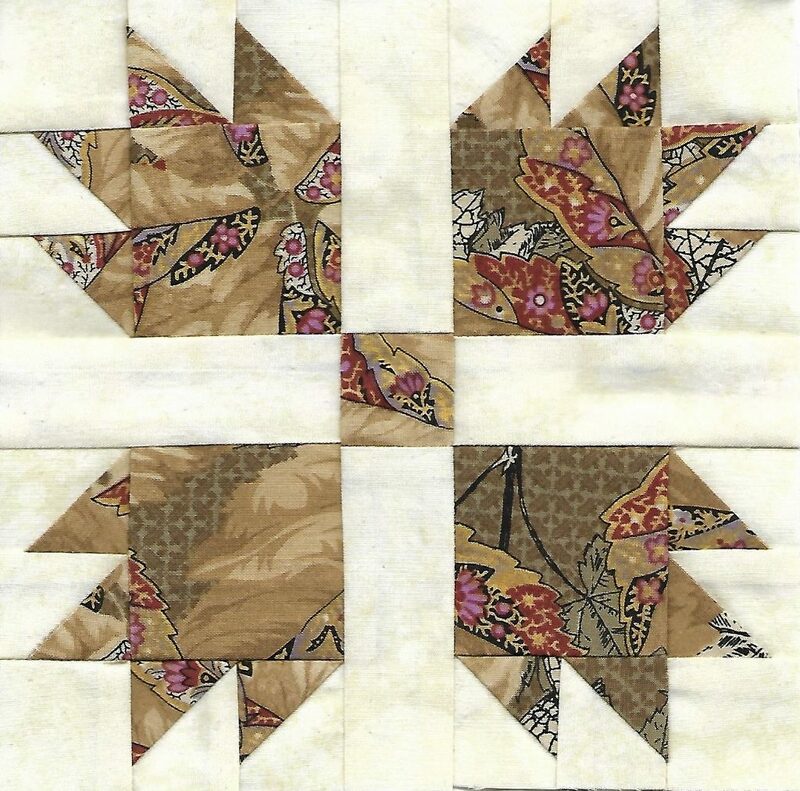 Changing the orange to gold produces a bit more contrast between the 4-patches and strip sets which I like. 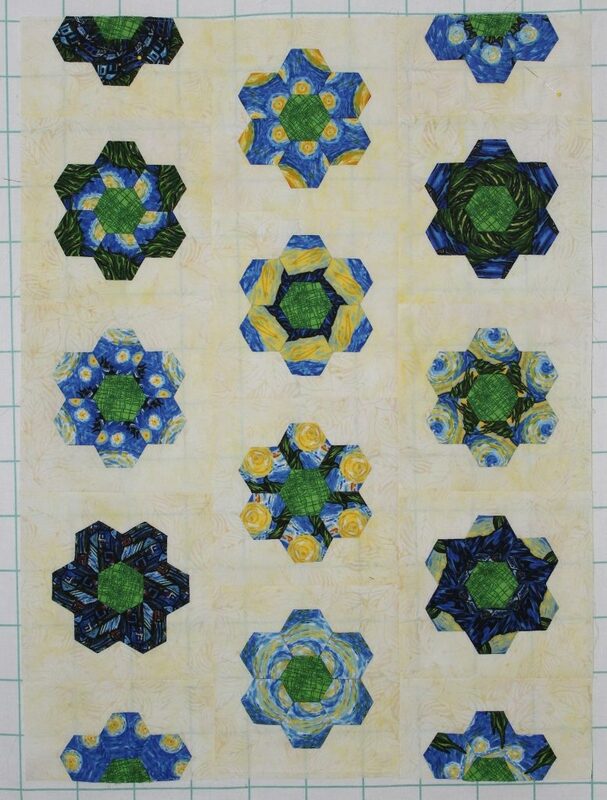 I am looking forward to making the star blocks and see how all my color changes play together.